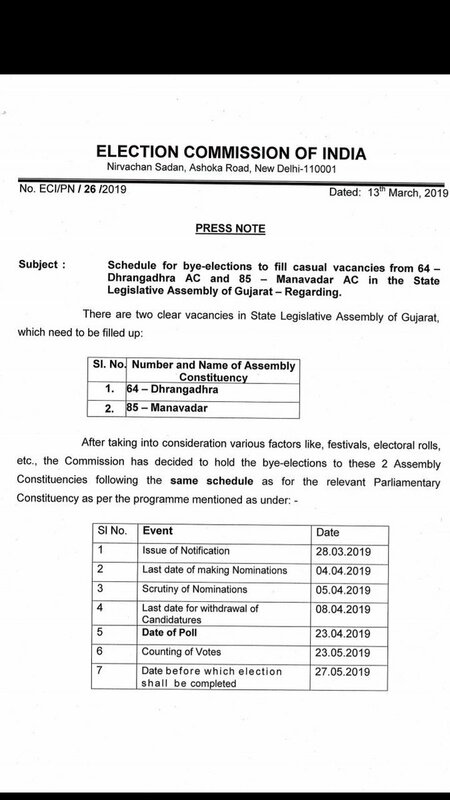 Gandhinagar: By-polls for Dhrangadhra and Manavadar assembly seats will be held on April 23 along with the Lok Sabha election. The schedule of these by-polls will be same as Lok Sabha election. Counting will take place on May 23. It should be mentioned here that Dhrangadhra Congress MLA Sabaria and Manvadar Congress MLA Jawahar Chavda resigned fromt he party and also from the assembly early this month to join BJP. Chavda has been made cabinet minister after he joined BJP. While Chavda’s candidature as BJP candidate is certain, Sabaria’s candidature is not sure as of now. By-polls for two more assembly seats namely Talala and Unjha are already declared along with Lok Sabha election. Talala seat is vacant because of disqualification of outgoing Congress MLA Bhagabhai Barad following two years jail term given to him by Sutrapada court. Unjha seat is vacant because of outgoing Congress MLA Ashaben Patel’s resignation from BJP and also from assembly.